AFC Fylde v Brackley Town. Danny Rowe for Fylde. FC Halifax Town kick off their Bank Holiday double-header with a trip to AFC Fylde on Saturday (3pm). Fylde temporarily moved to the top of the Conference North on Tuesday after drawing 3-3 at home to Salford, which was played in front of a club record crowd of 1,832. 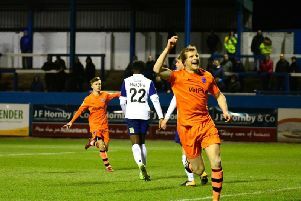 Striker and Conference North top-scorer Danny Rowe has scored seven goals so far this season, and has six in his last three games. He netted 37 goals for Fylde last season. Rowe started his career at Fleetwood and has also previously played for Stockport and Lincoln. Fylde have scored 14 goals in their previous three outings. Former Halifax defender Steve Williams, who scored once in 26 league games for Town in the 2014-15 season, has already netted twice this campaign. Nathan Hotte won’t take any part in the two games, but his injury has settled down and is expected to be back in training next week, and could have a chance of featuring against Telford next weekend. Liam King experienced a minor reaction to his back injury after his cameo appearance against Tamworth last Saturday, but it was hoped he would take part in training last night. Centre-back Matty Brown’s operation on his troublesome ankle injury was a success and he has now had his protective boot removed. He is set to undergo a week of intensive rehabilitation at the national football centre at St George’s Park. Fellow defender Scott McManus is said to be progressing well, but is considered a longer-term casualty. Billy Heath guided North Ferriby to three wins out of three against Fylde last season, including a 2-1 victory in the play-off final, with Rowe failing to find the net in any of those matches. Current Town skipper Liam King and striker Tom Denton both scored in the home and away league wins, while Shaymen defender Danny Hone scored the winner in the play-off final. Coach travel to Fylde costs £10 and leaves at noon. For more details call 07707 143094. Town then host Harrogate on Monday (3pm).